How to Use the 2016 Pantone Colours in Your Wedding? Every year, Pantone declares what is the color of the year. This year they have chosen two colours, Rose Quartz and Serenity (Pale Blue for us guys). How do you go about working with two colors? Emmy Scarterfield, Creative Director of Emmy London, loves using mood boards. Emmy London is a luxury shoe and accessories brand that encompasses undeniable beauty, bespoke craftsmanship and the quintessentially British style. The design process typically starts with a mood board, I love a mood board! Then sketching starts and I refine my ideas several times before I’m confident that I’ve created a balanced collection of styles, keeping every bride-to-be’s personal style in mind. I am really passionate about providing our creme de la creme bespoke service, our brand heritage. The collaborative creative journey with the bride is a real privilege. Her mood boards are available for your inspiration. 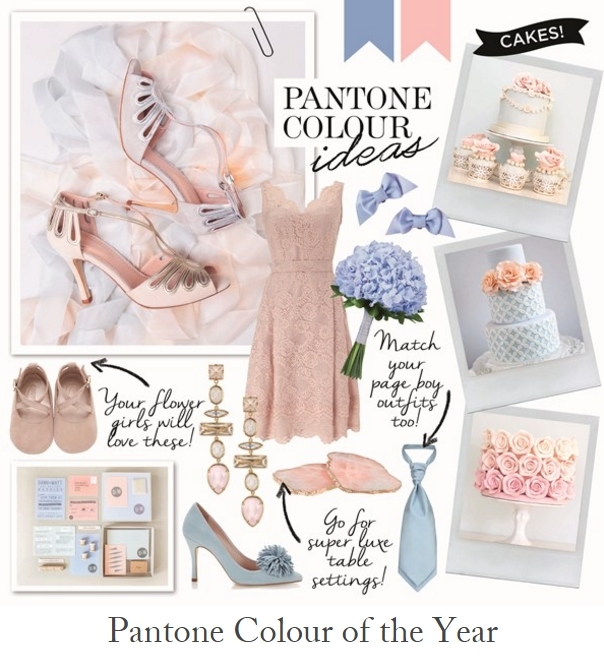 You & Your Wedding created a pretty Pantone Colour of the Year Mood Board that included Emmy London’s Leila shoes, Suzannah in Duck Egg and Mimi in dusty pink.